Jenny Lawson is refreshingly honest about her struggles with depression, anxiety and other issues. In this interview with hosts Tricia and Greta, Jenny explains why she approaches tough situations with a sense of humility, hilarity and a surprising amount of taxidermy. She recounts some of the most absurd and inspiring moments in her life in a new book, Furiously Happy. (You know, the one with the amazing raccoon on the cover.) Jenny has also blogged for about a decade, and writes as The Bloggess. Furiously Happy is less a memoir and more of a collection of stories about how to be happy even when your brain chemistry doesn’t want you to be. Which was exactly Jenny’s mental state when she decided to write the book. JENNY: I had no emotions left to give except to be angry that life had thrown so much crap at me, and that I had to deal with this. And so I decided that as soon as I was out of this depression, I would become furiously happy. Just out of pure spite, I would do everything that I could to be happy. And that meant doing ridiculous things, and saying yes to things that I wouldn’t normally do. And that wasn’t a cure for depression. But once I was out of the depression, I was able to focus more on doing things to make me extremely happy, and to laugh. So that when I was dealing with depression again, I could take those memories and pull them back with me with me as tools. To remind myself that depression lies, and that I will be OK again. And that I have laughed in the past, so even though I can’t imagine laughing again, it happened before, and so it will happen again. TRICIA: I think that’s such an interesting way of looking at it—a tool for the next go-around. Because I think so often, people mistakenly think it’s a choice. But there is a power in saying that you’re going to do things in spite of your what your brain chemistry is trying to force you to do at that moment. I really like that notion of being spiteful of your own emotions. JENNY: Exactly. When it comes to anxiety particularly, there’s a lot of times when I think, “I can’t do this, I can’t do that.” And actually, one of the wonderful things I’ve done is given myself permission to not do things. Which can be a wonderful gift to give yourself. But I do also sometimes really push myself to do things that I would not normally do because I know if I don’t… those are going to be moments I never appreciate. TRICIA: It’s a lot. Lemme tell you. I know the answer. The answer is 14. JENNY: It’s more than 14, let me just say. GRETA: Jenny, I think that’s really interesting because I’ve got anxious tendencies too, and I often find it really difficult to figure out, especially if I’m not in the right mindset, what I should be saying yes to and what I should be saying no to. How have you figured out where to draw that line personally in terms of ‘OK, this is something sounds terrifying in a good empowering way’ and ‘this is something that sounds terrifying and will probably incapacitate me’? JENNY: So there are a couple of things that I do. One I got from my friend Brené Brown, who said, any time anyone asks you for something, you should take the ring on your finger and you should turn it around your finger three times. And in the time that you’re turning it, you can actually think about whether you want to say yes or no. Because it’s so much easier to say yes than it is to say no, but if you give yourself a pause, you can really think about it. So every single time, I go, “One, two three…” and I don’t wear a ring, so it’s with an imaginary ring, which looks even crazier. The other thing is, I tend to ask other people. Because I have really great wonderful opportunities that most people would love to do, and I know that some of them I may regret not doing. So I tend to ask other people, “is this something that sounds like it would awesome or is this something that just sounds like it would be exhausting?” And most of the time, the people who know me the most can say, “You’re gonna be sick if you do this.” They’ll help me pick and choose. GRETA: One thing that you’ve talked about is spoon theory, which I think is a notion that everyone should know about. Can you describe it? JENNY: My friend Christine Miserandino is the one who came up with the idea of spoon theory. She described it to me, and I pass it along to everyone else, because it’s brilliant. Spoon theory is the idea that the average young healthy person wakes up and they have a fairly unlimited amount of spoons. And you spend a spoon on… you get up, and you wash your hair, and your brush your teeth, and there’s one for eating breakfast, and one for going to the bank, and you spend all of these spoons. You have plenty and then you go to sleep and they’re replenished. So It’s a really wonderful theory to help people understand what you’re going through. Especially if you’re the kind of person like me, where I may wake up one day and be like, “Oh, I’m totally OK, I feel completely like an almost normal person.” And then I will have two weeks of like, “I have no spoons. I cannot move from the couch.” The only thing that I can do is be a mother to my daughter and try to at least not let the house burn down. TRICIA: I think it’s especially difficult for artists and writers who want to negate the affects of anxiety, or depression, or even manic episodes, because I think we have romanticized the notion that to be a writer is to be hard-drinking. Or self-medicating. Or a little off your rocker. And that if you solve for those things and you’re living “like other people,” then maybe your art will go away. JENNY: Right. Right. There are some times when I think, “If they ever come up with a drug that completely cures me of the mental illness that I have, would I be the same person?” And I think I would, I think I’d still write the same stuff. But there’s also this little voice in the back of my head that says maybe I’m supposed to be this way. But at the same time, do you have to suffer to create art? I don’t think so. Because I have a lot of friends who write amazing things. They’re normal and sane. But then again, they want to hang out with me, so maybe they are crazy! I’ve always gone back and wondered... Is it that, if you’re dealing with mental illness, you have to get it out of your head in some way? And the easiest way is through art? And so that’s the reason why it feels like there are so many more people who struggle who are in art and music and writing? Or is it the other way around, that we spend so much time in our heads so it’s hard to escape from the things that are in there? I don’t know. But at the same time, if I had to choose between being me now or being a completely sane me, I think I’d really be afraid of that. I think I would really be afraid of what completely sane me would be like. TRICIA: I think the Jenny Lawson we have which is a little sane and a little insane sometimes is the perfect amount. JENNY: I like it! I will say during periods of depression, there are definitely times I think, ‘Oh no, I don’t like this, This needs to go away right now.’ But every time I come out, I come out with a different perspective, and with more empathy. And really I think that’s the greatest gift when it comes to dealing with mental illness-- it gives you so much empathy about everyone else, that everyone is fighting their own personal battle. Every single person is fighting a battle that you can’t see on the surface. And it gives you such a better perspective. In Furiously Happy, Jenny describes her struggles with anxiety, depression and a condition called trichotillomania. JENNY: When I was first diagnosed with [trichotillomania], it was terrifying. Because it’s… I mean, that’s something crazy people do: literally pull your own hair out on purpose. And I was afraid that when I wrote about it, it would really scare people away. Because I think you can say, ‘I have depression, I have anxiety,’ and even if people don&apos;t completely believe it or understand it, they hear about it enough that they&apos;re like, ‘Ok, you’re one of those people.’ But when you say “I pull my hair out,” there’s this step back sort of thing. GRETA: I imagine it’s really sweet to hear from readers who come to readings and confess to you and admit that they’re struggling also … is that ever really overwhelming for you, too, though? Does it become this confessional thing where they&apos;re trying to unload on your and it’s overwhelming? That takes spoons, too, right? 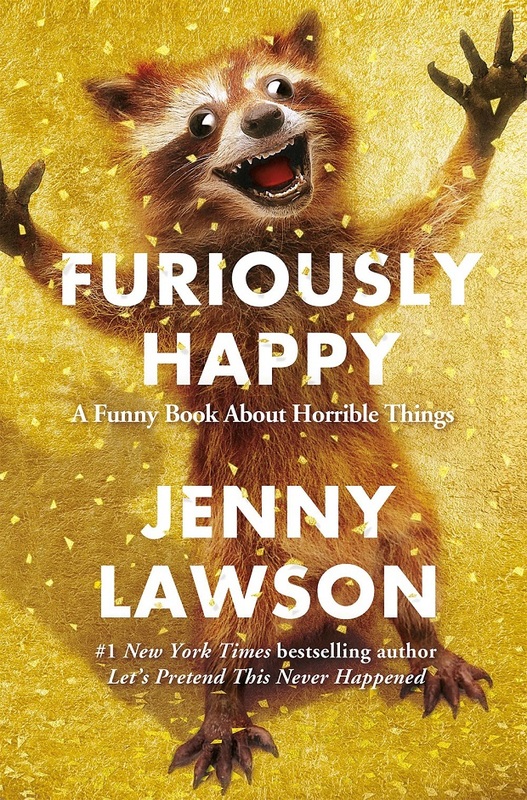 Jenny Lawson is the author of two books: Let’s Pretend This Never Happened and Furiously Happy, both of which feature taxidermied animals on the cover. You can follow her on Twitter @TheBloggess.